One of our guiding UU principles is respect for the interdependent web of all existence of which we are a part. This principle guides us to confront the urgent climate crisis that faces us, to work within and outside our congregations to reduce our impact on the environment, to advocate for climate-friendly policies, and to work cooperatively with other organizations that are striving to lower greenhouse emissions. 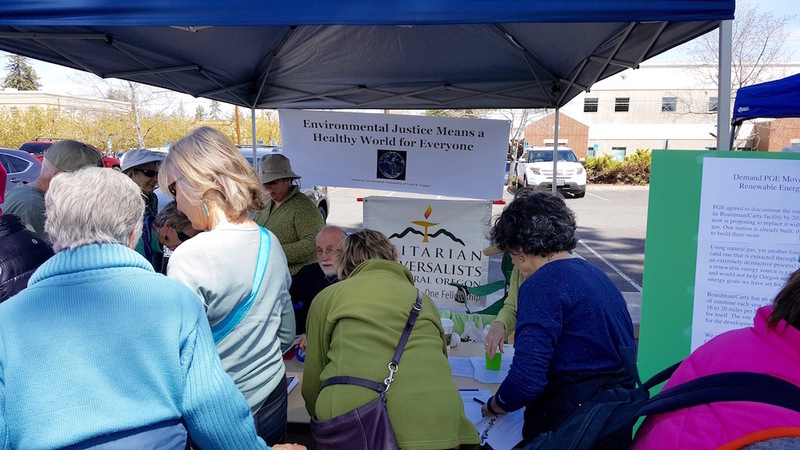 And, in community, we work to promote environmental justice as an integral part of the climate discussion. Other areas of environmental concern at UUFCO include: air and water quality, species protection, and the preservation of public lands. Recent actions we’ve taken as a congregation include supporting the Bend Women’s March and the People’s Climate March, working in coalition with other environmental groups through the Central Oregon Climate Change Coalition and elsewhere, organizing petitions to the Oregon Public Utilities Commission encouraging its members to deny PGE’s request to add fracked natural gas capability to their Boardman plant, and writing and calling our local representatives to ask for their support in reducing greenhouse gases. Working together, we can make a difference. Educate yourself on ways you can reduce your impact on the environment. Sign up for special environmental alerts via email, so that you know what issues are “hot” and what action you can take. Write a letter, make a phone call, or send an email to any or all of your representatives, urging them to recognize the climate crisis and to vote for policies that effectively address the issue. Join the Environmental Action Committee.